Make a basic memory game super personal! Use photos of your family members to create a keepsake game that is fun for the whole family! Collect digital photos of all the members of your family you want to include in the game. Aim for around 8-12 to keep the size of the game reasonable. Make sure the photos are all about the same size. To do this, I insert them in a word document and size them that way. This also lets you easily print multiple photos on one sheet of transfer paper. Print the photos out on the printable t-shirt transfer paper. Cut the photos out, making sure to leave space around the pictures. Put the photos face down on the fabric and iron them down. Make sure you leave enough space between the photos to cut out equal sized pieces of fabric. 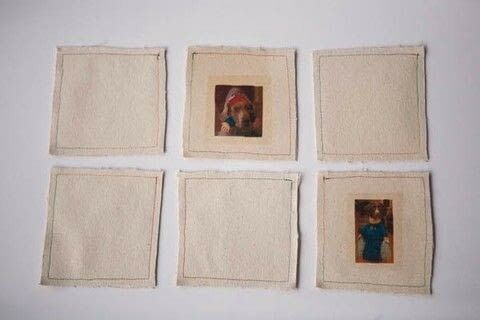 My pieces were each 4 inches by 4 inches square. 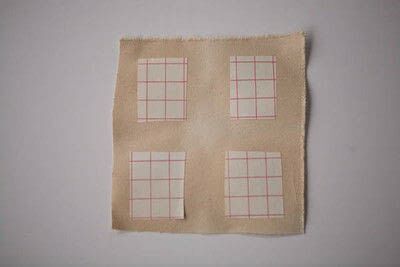 Once all the photos are on the fabric, cut out the pieces. Cut out additional blank squares of fabric – one for each photo piece you have. Sew the blank piece and the photo piece together, right sides out.